Raw Art Works (RAW) seeks a printmaker with vision and passion to orchestrate a printmaking studio for youth. 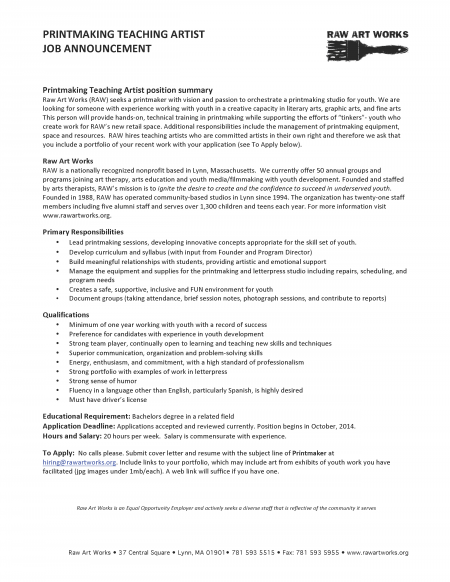 We are looking for someone with experience working with youth in a creative capacity in literary arts, graphic arts, and fine arts This person will provide hands-on, technical training in printmaking while supporting the efforts of “tinkers”- youth who create work for RAW’s new retail space. Additional responsibilities include the management of printmaking equipment, space and resources. RAW hires teaching artists who are committed artists in their own right and therefore we ask that you include a portfolio of your recent work with your application. •	Lead printmaking sessions, developing innovative concepts appropriate for the skill set of youth. Application Deadline: Applications accepted and reviewed currently. Position begins in October, 2014. Hours and Salary: 20 hours per week. Salary is commensurate with experience.